BillHustonBlog: Climate Heroes? Or Dangerous Saboteurs? 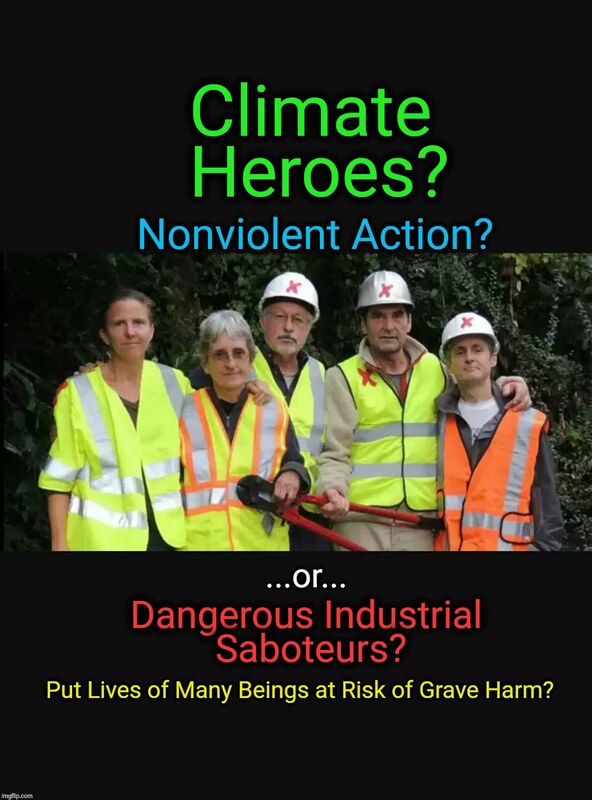 Climate Heroes? Or Dangerous Saboteurs? The essence of Nonviolent Action is putting YOUR OWN body at risk. What gives someone the right to to put OTHER LIVES in the line of harm? Were those potentially impacted others involved in the decision? In October 2016, a team of people associated with the Climate Disobedience group, shut down all 5 pipelines carrying Tar Sands products into the USA from Canada. Starting up & shutting down a high pressure crude oil(*) pipeline is a very tricky business. It requires specialized knowledge, interconnect diagrams, etc. it requires coordinated efforts of dozens of people spanning hundreds of miles. There are massive forces involved, and flammable, toxic materials, which if spilled, can poison a watershed for generations. Closing block valves on active pipelines improperly can CAUSE a rupture! Pipeline safety historian Michael Holmstrom​​ has documented a dozen examples. A dozen experts on the Pipeline Safety Trust listserv all said this was dangerous and foolish. There was perfect consensus and no dissent. Does it make sense to risk spoiling the Earth (killing the patient) in order to save Her? Did these people fully understand the RISK OF GRAVE HARM they were creating? What about the negative PR had there been a spill? The grave damage in public opinion had there been a ruture? IMO, what these people did was NOT nonviolent action. It fails the Precautionary Principle. It fails the Prime Directive of all environmental activism (protection, nonharming). There is ONE argument which might justify such industrial sabotage, but I have not heard them make it. They have a great PR team, they are doing podcasts and conference calls and public events. Are they acknowledging the risk they took? No! They supposedly took precautions to mitigate the risk. Are they discouraging others from doing these same actions, who might not take the same precautions? No! They are NOT doing this in the materials I've witnessed. These folks should visit Mayflower Arkansas and talk with people there and see the damage caused by the EMPCO Pegasus ruptured first hand. There is a chance this incident was caused by an improperly closed block valve on an active, high pressure Dilbit pipeline--EXACTLY what these "valve turners" did. If they took this action which put the lives of many beings at risk, without understanding the risk at the time, then they should apologize and beg for mercy from the court and maybe ask acknowledgement their intention to do good work to save the Earth. If they cannot understand the possible grave consequences of their actions, then they are non compos mentis, criminally insane. If they understood the risk and acted anyway, this seems like a criminal act, by definition!! Or do they have a damn good reason? What is that reason? The overall potential harm of climate change is far worse? Yes, I agree that climate change risks mass extinction. It may already be underway. But did they survey every other living being potentially impacted by their actions? NO. This is why I believe this is a criminal act and suggest that you DO NOT DO THIS!!!!!! I do believe in NVDA and radical action to save the planet, but MUST be UNAMBIGUOUSLY nonviolent action. Gandhi's Satyagraha, Women Suffragettes, MLK, "My Name is Alleganey County", "We are Seneca Lake", the Water Protectors at Standing Rock-- all examples of TRUE and unambiguous nonviolent action. I am not an expert on oil pipelines but it seems to me that the valves were put in for safety reasons. To shut off the flow in case there was a rupture. Therefore shutting the value should not cause ruptures but control them. The fossil fuel industry does not give a damn about anything but profit. Once a market has been fully exploited their only choice to keep increasing profit is to open other markets. They have done this by transporting dirty low grade oil to developing countries under the guise of helping communities develop energy resources. The fossil fuel industry does not care if the world becomes like China where the citizens have to wear masks, live in closed air systems, and prematurely die from lung disease. So, your caution about killing people is almost laughable. How many have died who work in the oil fields? How many have died because of pipeline explosions? How many have suffered from drinking poisoned water? What are we to do when the oil industry pats us on the head and continue to do as they please? They own the courts and now they own the White House. Enough. We need to stop exporting death and I am fully behind those who actively take steps to stop it. They are heroes. > but it seems to me that the valves were put in for safety reasons. To shut off the flow in case there was a rupture. Therefore shutting the value should not cause ruptures but control them. This is where some knowledge of pipeline physics might come in handy. Closing a block valve on an active, pressurized, high-pressure dilbit pipeline, is a little bit like trying to stop a speeding freight train by parking a 40 ton cement mixed on the tracks. *Maybe* the train can stop in time, but it GREATLY increases the chance of a catastrophe. > How many have died who work in the oil fields? How many have died because of pipeline explosions? How many have suffered from drinking poisoned water? What are we to do when the oil industry pats us on the head and continue to do as they please? They own the courts and now they own the White House. I AGREE with all of that. But the fact remains that these people CREATED THE CONDITIONS for a pipeline rupture. They put the lives of countless living beings at risk. A rupture of a dilbit pipeline could contaminate an area for decades to come (e.g., Kalamazoo, or Mayflower).